This article was originally published on April 17, 2018 and expired on September 17, 2018. It is provided here for archival purposes and may contain dated information. BLOOMINGTON, Ill. – University of Illinois Extension Local Foods and Small Farms Educator, Bill Davison, says “kale is at least 30-40 percent cooler than broccoli.” The reasoning behind this prevailing statement is the ease in which it is grown and how ornamental it can be. Kale is a cool-weather crop in the same family as broccoli, cauliflower, and kohlrabi. It is harvested for its leaves and can be planted in early spring or late summer for abundant harvesting. It has large, textured leaves and grows three to four feet tall. Kale can be grown from seed or transplants. Transplants can be planted in the garden three to four weeks before the last frost date in the spring. Seeds started indoors in early spring can be ready for planting in five weeks. It is best to harden the seedlings by gradually placing them outside in full sun. Transplants can be planted, leaving 18 to 24 inches between plants. Kale will benefit from adding compost before planting and a layer of mulch to conserve moisture, and grown in full sun. The outer leaves are harvested while they are tender and young, leaving the plant looking like a palm tree. Davison's favorite cultivar is ‘Lacinato Rainbow,’ and is popular for its vigorous, curly, dark leaf with pink veins and greater cold hardiness. Kale should be planted again in the late summer to early fall for a second crop. In fact, the taste of kale is better after a light frost. Swiss chard is actually a beet selected for its bright and colorful leaves. The industry sells Swiss chard in packs as an ornamental cool weather annual. “Bright Lights” is the paradigm for multicolored Swiss chard. Swiss chard can be planted as soon as the soil is workable and above 40 degrees. Swiss chard is harvested similar to kale. If grown for baby leaves, start from seed and harvest entire plant when it is three inches tall. If a continued harvest is desired, start from a transplant and remove outer leaves as the plant continues to grow. Beet seeds can also be planted with the same soil specifications as chard above. However, no more than a third of the beet greens should be harvested from the plant while it is producing the deep red orb. Seeds should be thinned to three or four, allowing you to eat the small seedlings. Succession planting every week or two allows harvest throughout the growing season. Beets can be planted up until the middle of July. 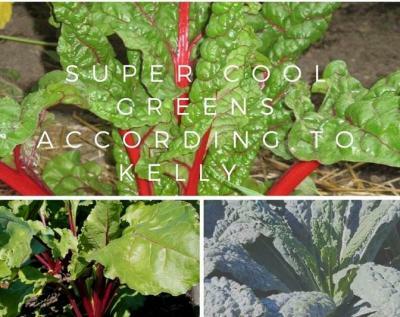 Written by University of Illinois Extension Horticulture Educator, Kelly Allsup. For more information on Extension programming, please contact us at your local Extension office or check out our current events calendar at go.illinois.edu/LMW.